Welcome to Letter H! 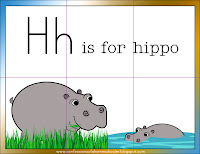 We are having fun with Hippos this week! Hope you enjoy! Read Chicka Chicka Boom Boom and put up the letter H on our Alphabet Tree! You can download my small alphabet letters here. 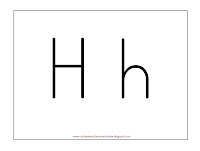 Letter H sign language: I found these sign language flashcards here! 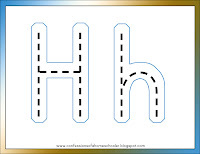 Letter H Tracing: I laminate this and use with Expo Dry Erase Markers for pre-writing practice skills. 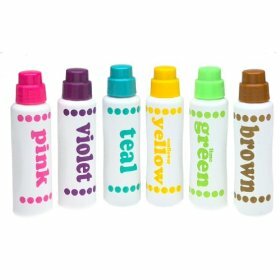 Hh Do-A-Dot Page: We use Do-a-Dot Art Markers with this! Hippo Scissor Skills! A new one, I’ve been wanting to do more scissor skills, so decided to add an activity for my alphabet packs! Just print and cut along the lines. I’ll be doing these for future letters and changing up the patterns as well. 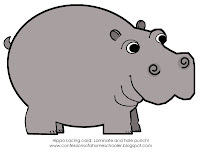 Hippo Cut & Paste: A new activity we are trying, cut out the hippo and glue onto construction paper, or better yet, paint a background! 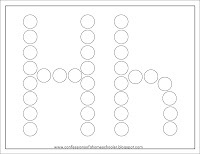 Letter Poking Page: Instead of tracing our letter, for this activity we are going to use a toothpick, or we have these cute Oversized Push Pins, to poke holes through the paper in the shape of the letter. 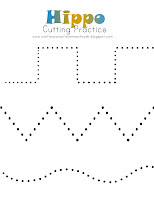 Print on regular paper for easier poking, and do this one on carpet 🙂 Another idea would be to hole punch along the lines of the letter as well. Both work on motor skills! Note: To get all of the games in my Letter of the Week curriculum, please check out the curriculum in my store! 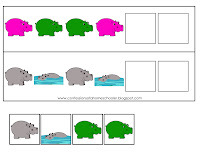 Hippo Size Sorting! I’m doing a variation on the usual size sorting game (small, medium, large), this time I’ll have her put them in order small to big or big to small. Afterwards, we discuss which one is biggest, smallest, medium. 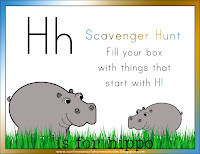 Hippo Scavenger Hunt: fill the box with things that start with H! Some ideas: hat, horse, hand, hotdog (fake food), heart, hammer. 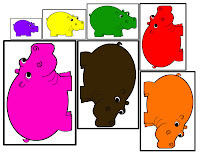 Hippo Puzzle: Easy, just cut along the guidelines and you have a 6 piece puzzle! 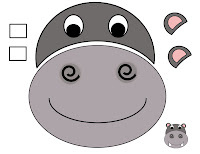 Hippo Pattern Activity: Use the pieces to practice patterning skills, a pre-math skill. 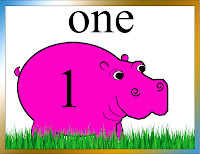 Hippo Number Practice: I laminate then hole punch the upper left corner, and bind with a keyring. Then we use dry-erase to practice writing our numbers. 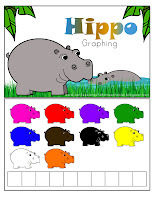 Hippo Graphing: I laminate this and then have them either color in the dots with dry-erase marker, or put bingo markers on it. The Teeny Tot likes to get involved. 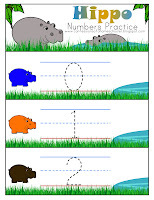 Hippo Large Floor Numbers: I made these large floor numbers so that we can play a hopscotch type game. I call out a number and she jumps to it! You could also have them put the cards in numerical order. 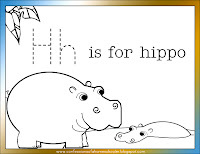 Hippo Coloring page: color or use Do-a-Dot Art Markers, Pip-Squeaks Markers, you could also paint, watercolor etc. 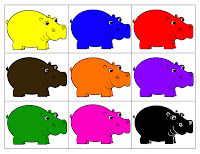 Hippo Color Word Match: Match the correct color hippo to the word on the card. Because we’re in Prek, I colored the words to help her, but you could print page 1 in gray-scale for more of a challenge! I may still cut these little guys out then cut them in half in as many different ways as I can think of to make tiny color matching puzzles as well. 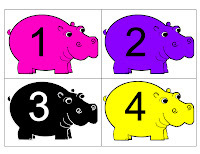 Hippo Number Cards: I use these with either mini-clothes pins, colored paper clips, or put a hole in them and have her attach chain links to them. Whatever you use, just have them put on the correct amount for the number on the card. These are also good for putting in numerical order. In the below picture, my dd clipped numbered mini-clothes pins to each card. 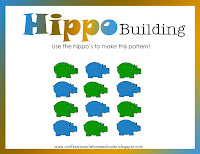 Hippo Building: These activities are great for spatial relations, patterns, logical reasoning, geometric concepts, & computation skills. Click here to see CREATIVE COLOR CUBES ACTIVITY CARDS! 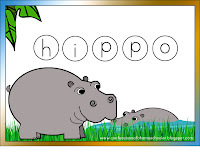 Hippo Letter Matching: This is a fun letter matching activity, that practices both upper and lowercase letters recognition! If you’re looking for more challenge, use the uppercase card with the lowercase letter disks or visa versa! 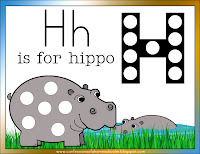 (The download includes upper and lowercase letter disks and activity cards) Click here to see the process of making the letters. 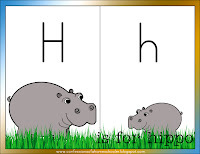 Capital/Lowercase H sorting: Simple, just sort the uppercase and lowercase letters. Color Cubes: I found a new use for our Large Alphabet Lacing Cards! First we traced the letters with her finger, then we used our 1″ building blocks to make the letter D and d. She also picked 2 colors of blocks and did a pattern as she made her letters! We also use them for lacing practice, but this was a new variation since I’ve been making the shaped lacing cards too! 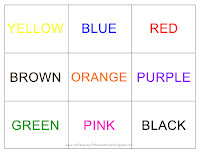 Click here for more fun with Creative Color Cube Activity Cards. Extra: See my Money Saving Tips for help with printing, laminating and storage questions and tips! Thank you so much for this post. I want to let you know that I posted a link to your blog in CBH Digital Scrapbooking Freebies, under the Page 5 post on Nov. 26, 2010. Thanks again. Do you have the sign language print outs available on your website? Thanks for all you do! FABULOUS: Sorry, I don't have the sign language cards on my site, I am working on them. SHILPS: I think usually 3 years old is good for my LOTW activities. I'd say give the lacing a try and if it works then they're ready, if they're frustrated then they're not!